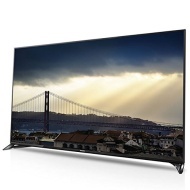 alaTest has collected and analyzed 149 reviews of Panasonic TX-50CX802. The average rating for this product is 4.5/5, compared to an average rating of 4.6/5 for other products in the same category for all reviews. Comments about the price and design are overall positive. The sound and usability are also appreciated. There are some critical reviews about the energy efficiency and remote control. The connectivity and size get mixed comments. We analyzed user and expert ratings, product age and more factors. Compared to other products in the same category the Panasonic TX-50CX802 is awarded an overall alaScore™ of 92/100 = Excellent quality. I purchased this after being advised that it had Skype capability. I haven't got what I wanted and I don't find navigating for options and features that straight forward. Overall disappointed.